Rochester, WA (June 4, 2018) Nineteen-year-old Brittney Zamora (Kennewick, WA) battled a stellar field of veteran and rookie drivers to win the Northwest Super Late Models, Inc. (NWSLMS) second outing at South Sound Speedway. Last year’s NWSLMS Champion was the point leader heading into this event. The second-generation driver held fast for a green-white-checkered finish against the hard charging runner-up, Braeden Havens. 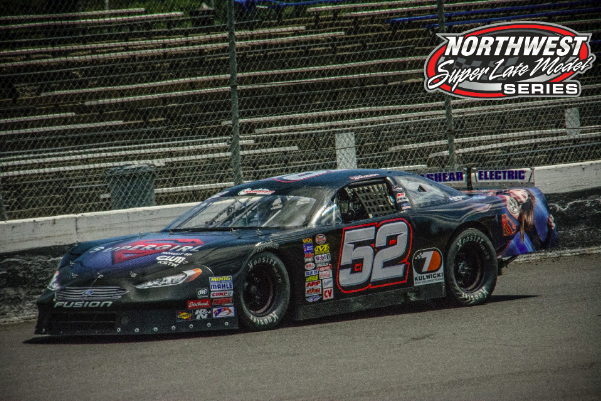 In addition to the NWSLMS events, Zamora has been competing regularly at Evergreen Speedway in the Super Late Model division, as well as being a driver representative in the Alan Kulwicki Driver Development Program. Bob Presley (Olympia, WA), Andy Sole (San Tan, AZ) and Chad Hinkle (Yakima, WA) rounded out the top 5 in the second event of the season. Mitch Kleyn (Quincy, WA) and Brooke Schimmel (Woodland, WA) would bring the field to green after pole setter, Alan Cress drew lucky number 8 for the 125-lap invert. Kleyn battled for the lead with both Schimmel and Moriarity as the drivers jockeyed for position around and behind him. The inside groove proved to the be fastest way around the 3/8s mile oval. Drivers frequently lost positions, rather than gained once they were on the outside. Kleyn would keep the lead until lap 55 when Zamora made her presence known and took the inside groove for the lead. With Zamora came Havens to take over second position a few laps later. Kleyn and Schimmel were once again battling, this time for the same real estate. The two got together bringing out the yellow flag and sending both drivers to the back of the field. Zamora was on cruise control with a ten-car lead over Havens and looking for the finish line, when Kurt Meyer spun bringing out the final caution of the night. This would set up the green-white-checkered drag race to the checkered. Zamora easily brought home her third career victory, completing her Alan Kulwicki Polish victory lap to cap off the night. Bob Presley hovered in the top five throughout the event, staying out of trouble and able to bring home a third-place finish. 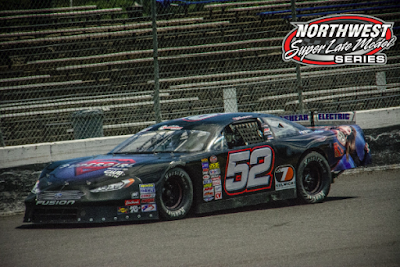 Andy Sole shuffled back and forth through the field, settling in the fourth position at the checkered. Chad Hinkle recovered from an earlier spin and trip to the rear of the field to take the final position in the top five. Hinkle’s experience at South Sound Speedway was a key factor in getting him back to the front.